PowerSwitch :: View topic - Life extension of existing nukes. Posted: Tue Dec 04, 2012 9:03 am Post subject: Life extension of existing nukes. Hinkley B and Sizewell B life to be extended by seven years. Wonderful news. That will give us time to build plenty more renewables, and implement radical energy saving. After the seven years we can abandon nuclear and fossil fuels . Is there a flaw in my argument? 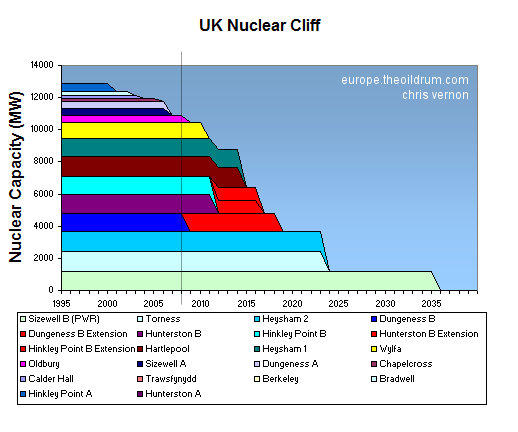 Heysham and Hartlepool have subsequently had their lifes extended by two years and now Hinkley Point B and Hunterston B get an extra seven years. Do we know what implications this has, if any? Were the initial lifetimes just guesses, so that a change to them isn't particularly significant? Or is it truly a "get back on the pitch, even if you can only stand in the way" type situation? I think I may have meant Hunterston B. It was on the radio this morning just before I woke up. Might just have been a nightmare. You're cracking up, Biff (this is a transferred epithet). Doubts have been raised about the continued operation of Hunterston B. The current maintenance outage for inspection of the graphite core has revealed a number of cracks in the graphite bricks. Some cracks are to be expected and a limited number are acceptable, but the arguments are regarding how many cracks are acceptable. Cracking of the graphite is undoubtedly a limiting factor in the safe working life of the reactor, it remains to be seen if this is the end for this reactor or not. I suspect that it will be allowed to run for another year or two, but not for much longer. Under normal steady state operating conditions the cracks are of little consequence. The risk is that an earthquake could distort the core, prevent the insertion of the control rods and potentially prevent a controlled shutdown. Also, Dungeness B is shut down for a planned outage and is not expected to resume operation until the Autumn, this is a longer planned outage than most, and AFAIK is for examination of the graphite blocks that form the core. As these reactors are the same design as those at Hunterston, and have also been life extended, I wonder if cracked graphite blocks will also be found in problematic numbers. One reactor at Hunterston B was due to re start at the end of this month, but this has now been put back to the end of JUNE ! The other reactor is still listed as being expected to re start at the end of April, it remains to be seen if this be achieved.